The first photo - 3 in one! Well actually 4! After posting and I saw this larger there is also a planet (possibly Venus) below the moon. I remember now that it was there :) This is the first photo I took when we arrived at the lighthouse last Saturday. 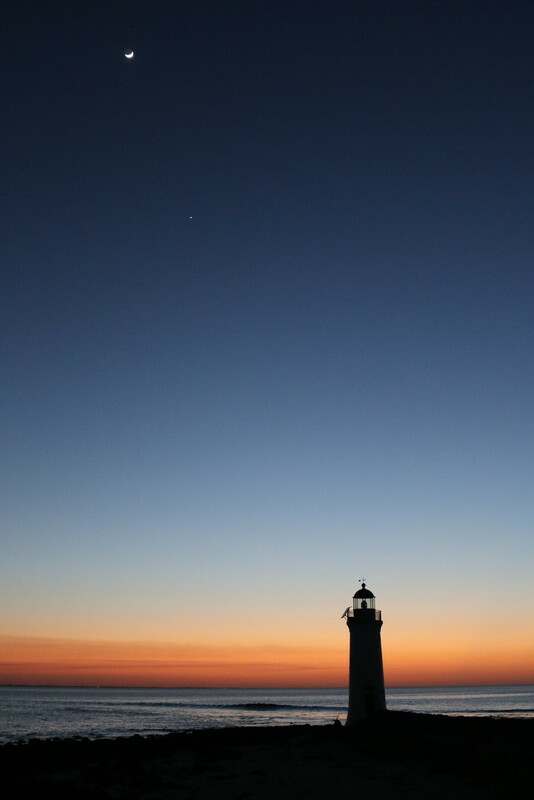 I was excited to see the moon along with the sunrise and lighthouse. Still struggling to get out with my camera at the moment. What a beautiful capture! Love it. All three subjects are beautiful! Oh so beautiful! Once in a while we have the moon and Venus lined up, it’s always exciting. Stunning on black! 5* WOW! A very excellent composition, and the light and color are just perfect! Fav! Great shot, viewing on black brings out all the detail, looks amazing. If I could fav this a million times I would! beautiful photo. wish I were there! following back!